The fall weather is approaching and that means meals like pot roasts and soups will be in full swing in my kitchen. For cool weather meals, I also like to bust out my slow-cooker. The slow-cooker is a perfect tool to use for when you want a meal with minimal effort. It is great for busy workdays or school days. All you need to do is a little prep, set it, and forget it. 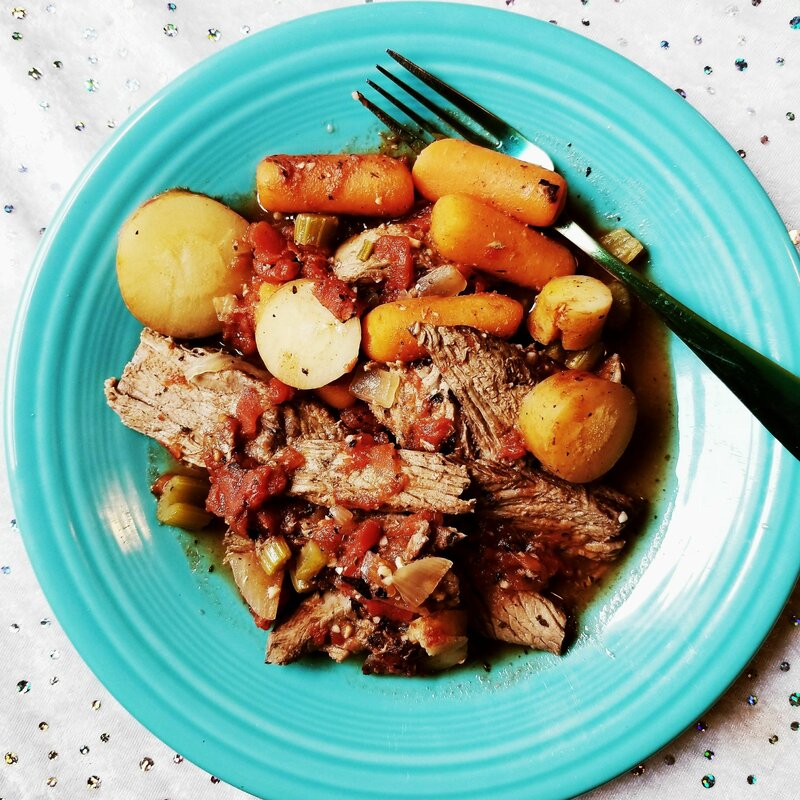 Today I will share with you how I made myÂ paleo pot roast slow-cooker and the recipe for it. The meat and veggies are the stars of the show. Simple ingredients and effortless steps to obtain an incredible meal. This was our first time trying out parsnips. I wanted to be adventurous with this roast and add something new to it so we went with that. My daughter, Chloe, actually loved them and my husband was on the fence about it (he is somewhat picky). I really enjoyed them and would continue to use them in my roast recipe. I would actually probably add another one or two next time I make pot roast with them. The recipe for this roast is below. The prep is minimal and the slow cooker does most of the work. This recipe will result in about 4 servings, possibly more if you buy a huge hunk of meat. Warm 2 tablespoons of olive oil in a large saute pan or cast iron. Pat your roast dry with paper towels. Season both sides with garlic powder, salt, and pepper. When the pan is hot place roast in the pan and sear all sides to give it a nice brown crust. Remove roast and place in slow cooker with 1/2 cup of beef broth and 28oz can of drained fire roasted tomatoes for 6 hours on low. Give the Italian seasonings a good shake to the beef and tomatoes in the slow cooker and stir. Wash all vegetables. Using the same pan that you browned your beef with, place garlic and onion in the pan with 1 tablespoon of olive oil. Cook for a few minutes then add all of the veggies (the carrots, parsnip, and celery). Add about 1/2-1 tablespoon of Italian seasonings to veggies. Salt and pepper to taste. Cook veggies on medium high for a few minutes to soften them just a bit. Once veggies are softened a little place them in the slow cooker with the meat and tomatoes. Approximately five hours into the process you can shred/cut your beef and place it back inside the slow cooker. After cooking on low for six hours your pot roast will be ready to eat. So there you have it! Paleo Pot Roast With Parsnips and everyone joined the Clean Plate Club. I think we were all anticipating this first roast of the season. I am sharing this recipe with you in hopes that you will love it as much as my family did. What did you have for Sunday dinner? Leave me a comment and let me know. I would love to hear from you! This entry was posted in My Cooking Journey, Recipes and tagged carrots, celery, fire roasted tomatotes, garlic, gluten free, meat, paleo, parsnips, pot roast, roast, slow cooker, tomatoes, vegetable. Bookmark the permalink.